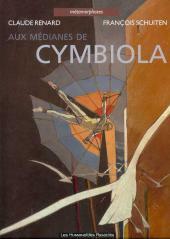 Aux médianes de Cymbiola, sci-fi tale made mostly in black and white, is an almost poetic variation on the myth of Icarus and geomancy, the exotic and grandiose scenery of the desert world of Cymbiola. It discerns already taste of utopias and imaginary city that will serve as cornerstones to the cycle of the Obscure Cities. No longer available. Aux médianes de Cymbiola is part of the Metamorphoses album.